Packing up our house and moving to a completely furnished one in Florida brought the “reality” of real estate home for Larry and me. Although our last move was over thirty-six years ago, I I felt we were up to the task. I proudly went through my newly created “To Do” list: I contacted moving companies three months in advance. I began weekly and then almost daily trips to Captain and the library to give away unwanted household goods and the over two hundred books we had collected on our bookshelves. Larry and I reached out to family and friends to find new homes for our Early American furniture. At the same time we were clearing out what we didn’t need, we started packing up what I thought we would need. And this is when reality hit. Even after selling, giving away, and donating carloads of our life, we still had much more than we had ever imagined. Bath and Body Works Cherry Blossom shower gel; shoe horns from Larry’s parents’ store; nutcrackers and picks; scissors; supermarket totes, Special Olympics tee shirts—you name it, and we had duplicates and triplicates and more. We upped the amount we were NOT taking. Like the all-consuming plant Audrey in Little Shop of Horrors, however, the amount of stuff continued to grow. We purchased more moving boxes from Home Depot and more bubble wrap, tape, “Fragile labels,” and wrapping paper from Staples, and we kept packing and packing and packing. And we hadn’t yet touched the “essentials” from our kitchen, bath, and bedroom. Miraculously, by a week before our move, almost all of the packing was completed. I doubled checked the boxes to make sure they were securely sealed, numbered them with a thick marker, and inventoried them in a notebook. When I got to my one hundred and thirtieth box, I began to “real”-ly panic. We even opened up boxes to find items to leave behind. By that point, however, we knew most of it was going to be loaded on the moving van. We arrived in the evening of June 3 and were able to quickly unpack what we brought down in our cars: our suitcases, pillows, sheets for the king-sized bed, a couple of towels, two of each of plates, silverware, wine glasses, regular glasses, two knives, two pots, a corkscrew, and a bottle of wine. After a quick trip to Publix for fruit, vegetables, milk, bread, salmon, and veggies, we were good to go. It was like being newlyweds. By that time, we figured out we should have left almost everything home as we already had more than enough to survive. Four days later, the van and our 130 boxes arrived. Within hours, we were both buried in bubble wrap. While I unloaded the kitchen boxes, Larry took care of the clothes and the rest of our household good. I cursed myself out loud: “How did I manage to bring so much when I thought I gave so much away?” Larry saved his comments for under-his breath rants. “We aren’t going to need long underwear in Florida!” or “I thought we weren’t bringing the pancake griddle!” or “When did we acquire two hundred Broadway musical CD’s?” When our realtors came over the second day of unpacking with a bottle of wine, they suggested that we (1) drink the wine. The entire bottle. Immediately; (2) empty all the boxes as soon as possible to “motivate” us to get settled more quickly; and (3) pile all the empty boxes in the garage so they could give them to another client who was moving. Larry took this advice way too seriously. 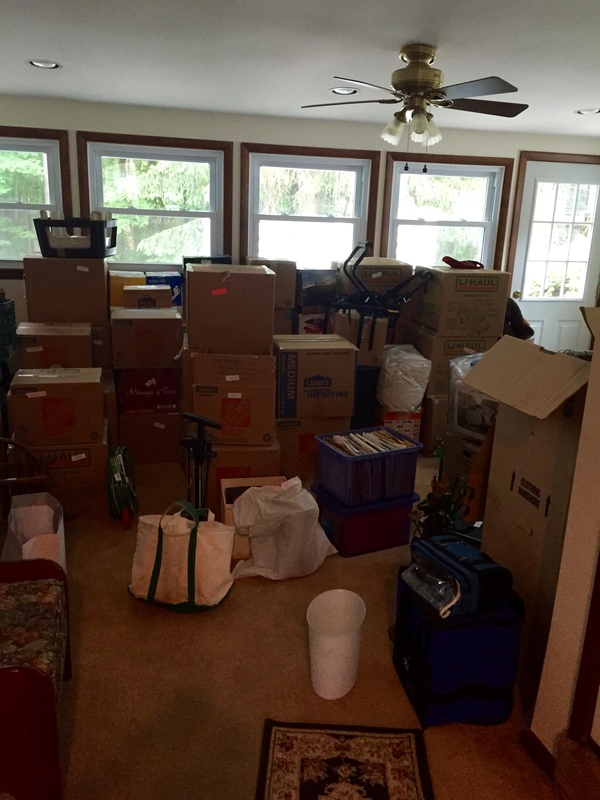 As I methodically continued to empty the kitchen boxes, Larry emptied every remaining box and piled all the contents on every bit of available space in the great room, office, and second bath. If that wasn’t upsetting enough, he had unloaded all the linens, sheets, pillows, and blankets on the bed in the guest room. When I walked into the room, I felt I was reliving The Princess and the Pea. The pile reached to the ceiling fan. I was so angry I almost slept in that bed that night, but I couldn’t climb on top of the mess. In the end, our move was successful. We actually had most of our boxes unpacked and organized by the end of the first week. Soon after, a Salvation Army truck picked up around fifteen boxes of items we didn’t need. We knew we would eventually have to deal with the pictures that we brought and had stacked in the second bedroom, but at least we were settled in all the other rooms. And the only things we misplaced in the move were my Weight Watchers charms and two boxes of toothpicks, both which we found six months later. Not bad, considering. Still, in hindsight, our “reality” experience is a cautionary tale for all my friends and relatives who are considering a move. Follow the same advice savvy travelers give: Pack only half of what you think you need and leave the rest behind. Meanwhile, if anyone needs a slightly dusty but usable pancake griddle, six pairs of long underwear or a Fiddler on the Roof CD, contact me. I will be sitting on our lanai in my tank top, my favorite pair of shorts, and my Tevas, sipping wine from a huge travel goblet, the only things I needed to pack in the first place. This entry was posted in Parenting on September 29, 2015 by shapcomp18.